Utilizing online ads is more essential now than ever to grow a business in the 21st century. The invention of online ads has given the small and medium business owner the power to compete with large companies by increasing brand awareness and landing your name in front of millions of eyes. Unlike traditional methods, online advertising gives you the opportunity to place your ads directly in front of your ideal customer on any device. Best of all, you maintain full control over your advertising budget. Online advertising is the ideal way to super charge your marketing efforts and drive additional sales opportunities to your website. By combining online advertising with marketing, business owners have the ability to reach an even larger audience than possible with just organic search. The massive reach of online ads makes it possible to get people interested in spending money on your product or service to visit your website on a global scale. Partner with METHODIC and get the most bang out of your advertising buck. With Google and Bing accounting for 98% of searches worldwide, business owners now have the power expand their customer base by targeting an audience and placing ads in front of their ideal customer. Search ads offer business owners great flexibility with the ability to customize ads to include important information such as: Location Targeting, User Reviews, Site Links, and much more. When you choose to run search ads, you only pay for ads that are clicked on; this allows METHODIC to help reduce your ad budget over time, while still maintaining your ads effectiveness. Best of all, you don’t have to have a ridiculous ad budget to compete. Search advertising is performed on a level playing field, the best ads win. If your brand thrives on sending visual messages, Social Advertising is a match made in heaven. Social Advertising allows business owners to deploy highly persuasive visual ads to show potential buyers what they can expect from your business. Advertising on social platforms affords business owners the ability to advertise to a global audience while maintaining the power to control who sees your ads with unparalleled granularity. Highly competitive and affordable ad pricing combined with the ability to control your ad budget helps ensure you don’t break the bank. 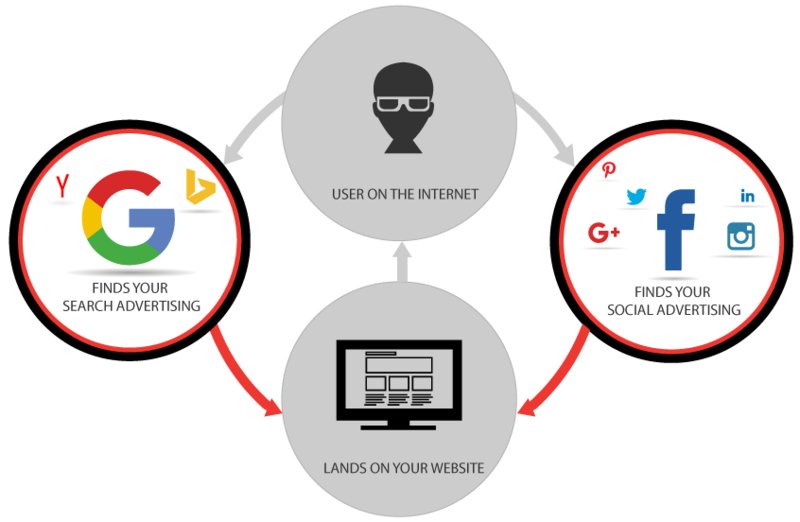 During this part of our process we collect all necessary account information to ensure that we have everything we need to run Search Ads on all platforms agreed upon. Advertising without understanding who you are targeting is a waste of time and money. That is why we take pride in identifying who will be most receptive to our advertising efforts and ignoring the rest. We conduct extensive research to uncover who is looking for businesses like yours and what they search to try and find you. Once we understand the behavior of the users, we make it our priority to put your business directly in their crosshairs. We want to make sure that you only spend what you are comfortable spending. Advertising budgets are established and set up front. We will work within these set constraints to deploy the best performing ads possible. Whether we’re advertising on 1 Social Platform or 4, it is important that we collect the correct login credentials from the start. Missing or incorrect platform credentials can bring an advertising project to a screeching halt, and we want to make sure that we keep the momentum. Identifying the perfect target audience is a sure fire way to ensure that your ads perform spectacularly. This is why we conduct extensive research to uncover who your business’ ideal customer is and what they search to try and find you. Once we understand the behavior of the users, placing your ads in front of them becomes a breeze! Before any ads can be run, campaigns have to be setup. During this part of the process we will identify and deploy the best organizational campaign structure according to the product or service being advertised. Once we know what we are advertising and how the ad campaigns will be structured. Its time to create ad titles and ad copy with our target audience in mind the entire way. Creating ads that convert is an art that METHODIC can deliver. Despite popular opinion, ads aren’t like a crockpot – you can’t just “set it and forget it”. We regularly monitor and optimize your ads to ensure that they are performing up to the best of their ability. Our goal is to decrease ad spend while maintaining ad effectiveness to save your business money over time. During this part of the process we will establish a campaign structure that will give us the best chance of running a successful advertising campaign. Campaigns are always built specifically for your business according to the product or service being advertised. Advertising on Social Platforms demands a visual style that is consistent with your brand and persuasive enough to grab the audiences attention. During this phase of the project we take the time to create ads that speak to your business as well as the people who are interested in buying from it. Monitoring and optimizing ads is one of the most important aspects of advertising on social platforms. We check to make sure that your ads are performing up to par regularly. Our goal is to decrease ad spend while maintaining ad effectiveness. This means continuing to drive sales while also saving your business money over time.